In 2014, I saw a video that changed my life. My husband sat me down, told me that this was going to be upsetting and showed me a video. It was a documentary from Australia featuring my cousin’s wife recounting her experience of being cut at the age of 7 in a dingy apartment in India by an old woman. Her telling of the story horrified me, which is the same reaction I have always had about Female Genital Mutilation (FGM) but what threw me was the fact that this was a Bohra woman, like me. She said this happens to all Bohra girls around the age of 7 and that it had happened to her sister, too. For a moment, I refused to believe it but as she kept talking, I realized that it could have been done to me too. I grew up in the UK and moved to the US in 1994. I immediately recalled that summer trip to India at the tender age of 7 to attend my uncle’s wedding. My mother had made me new dresses and I had matching hats and headpieces to go with them. It was going to be so much fun. What I couldn’t recall, though, was the actual khatna, but I have since received confirmation from my family that it was done to me. Even then, the reality did not sink in. How could I not remember it? Maybe it wasn’t done to me after all, maybe it was all a ruse to “save face”. What I’ve learned since is that some women erase the memory of the traumatic event completely and utterly. Sometimes, it can be restored and other times it can’t. I still haven’t accepted if it’s better to know or to not know. Either way, it feels like a violation. I cannot stand by quietly and let other girls in our Bohra community be subjected to this terrible practice. I will not be silent. Even though I do not recall my personal khatna, I feel lasting psychological damage has been done just knowing that it happened to me. I can only imagine the physical and psychological damage done to those girls and women who, to this day, have vivid memories of it. 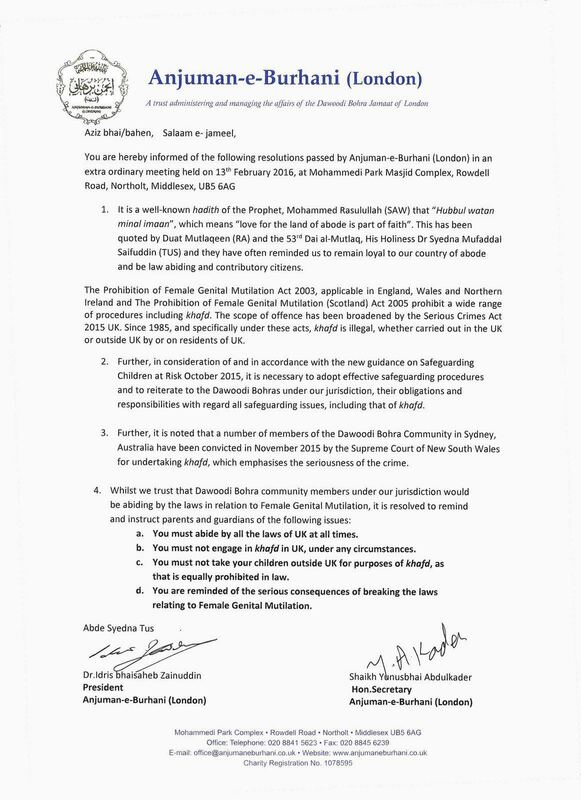 The Bohra jamaats in Sydney and Melbourne in Australia and, now, London in the UK have banned khatna (khafd). Why do our sisters from all over the Bohra diaspora still have to suffer when our sisters in Australia and London are spared? Are Bohra women valued more in some countries than others? All Bohra women are subject to the same rules and edicts from Aqa Maula, why is this any different? Khatna is illegal under Female Genital Mutilation laws in the US (18 U.S. Code § 116 – Female genital mutilation) but if khatna should not be done by some Bohras, shouldn’t it be extended to all Bohras regardless of the law in that country? If you had a daughter in Dubai, would you still consider subjecting them to khatna if your sisters in Australia and the UK are specifically told not to?